FOREWORD: Portland’s Decemberists have achieved the same aboveground success Death Cab For Cutie and My Morning Jacket have rightfully received – less than White Stripes, Modest Mouse, and the Strokes, but more than a handful of other deserving club dwelling types. Unlike the above-mentioned acts, singer-songwriter Colin Meloy’s acoustical folkloric creations rely on accordion, Hammond organ, and upright bass more than electrified amplitude. 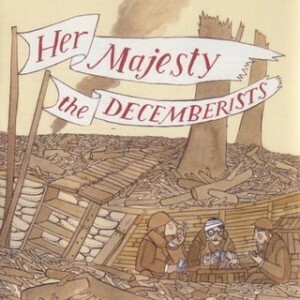 After I interviewed Meloy in ’03, Her Majesty The Decemberists broke out, allowing ‘05s even better Picaresque to heighten the Decemberists popularity enough to garner major label attention. ‘06s fabulous The Crane’s Wife got tremendous tour support and three years hence The Hazards Of Love triumphantly celebrated British folk with a rustic rock opera. Following a High Times softball game in July ‘06, some of our team headed off to Central Park’s Summer Stage to catch the Decemberists. Needless to say, it was one of the highlights of the year. This article originally appeared in Aquarian Weekly. 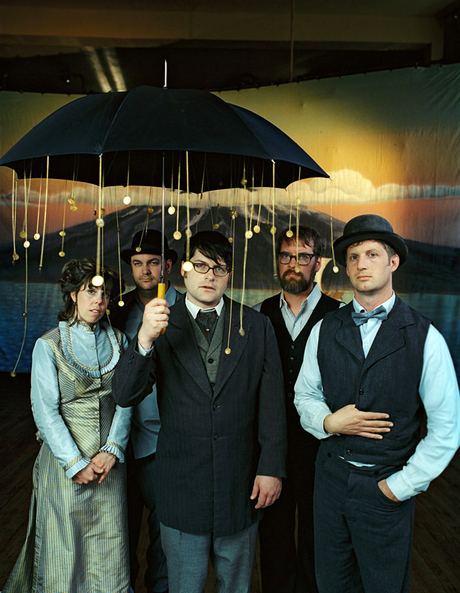 Singer-guitarist Colin Meloy grew up reading sci-fi fantasies in bucolic Helena, Montana, a peaceful province nestled between the Rocky Mountains and the arid plains. Since English was his strong suit, he attended the University of Montana (after a stint at Oregon University) to study literature and creative writing. Subsequent to “slugging it out in the trenches” touring the Northwest with formative band, Tarkio (named after a tiny railroad stop), Meloy became enamored with Portland, Oregon’s open mike poetry scene. He’d hook up with like-minded Classical-Jazz-trained partner Jenny Conlee (accordion/ keyboards) and hip-hop manager Chris Funk (guitar/ pedal steel/ dobro) as the Decemberists thereafter. Meloy’s increasing fascination with Victorian folklore, tropes, and figures consumed the Decemberists debut, Castaways And Cutouts; borrowing ideas from Irish folk and murder ballads celebrating dead baby motifs while securing bookish Brit-punk legend Robyn Hitchcock as a touchstone. For ‘03s brilliant follow-up, Her Majesty the Decemberists, newcomers Rachel Blumberg (drums, vibes, glockenspiel) and Jesse Emerson (upright bass) come aboard to further finesse the tantalizing troupes’ vintage visage. Whether hearkening to wayward seafaring allegories in the crickety squeeze box-consumed pirate parable “Shanty For The Arethusa,” portending war-torn savagery on the melodic brothers-in-arms accord “The Soldiering Life,” or saluting a ‘gypsy uncle’ on the elegant eulogy “Red Right Ankle,” this curious quintet unerringly collide rustic sacrosanct purity with cryptic calliope calamity. For proof, try the pastoral piano stroll “Billy Liar” and the ominous dreamscape “The Bachelor And The Bird.” Meanwhile, the Cockney-slung phantasm “Chimbley Sweep,” pulled from a Dylan Thomas poem, indubitably idolizes Hitchcock’s debonair delivery. Best of all, the truncated elegiac symphony “Los Angeles I’m Yours,” with its stammering acoustic strum, terse Stevie Wonder-like harmonica furl, and exquisite orchestral swirl, enchantingly hails the smoggy SoCal metropolis before souring cocaine calamity embitters the once-glowing experience. AW: Why does Portland attract so many intellectual bookworms? COLIN: (as a storm rattles his windows) Everyone has time to spend indoors. Musicians don’t come here for leisure activities. They’d rather mope around their rooms. (laughter) But my parents were avid music listeners. I received a steady diet of Rolling Stones, Fleetwood Mac, Eagles, and Joni Mitchell. My formative listening was influenced by a college-bound uncle who’d send mix tapes of college rockers like Husker Du and Replacements for Christmas. It was hard to come by this music in Helena. Your exquisite lyrical punctuation reminds me of stately Brit-rock bari-tenors Nick Drake and Donovan. I have a soft place in my heart for the warm gliding tenor. My ‘60s folk influences are limited, but Nick Drake I adore and listen to endlessly. I go back and forth with Donovan. I owned Hurdy Gurdy Man, thought it was genius, sold it back, then bought it again. He had a bad reputation and became the punching bag of the ‘60s folk scene. Jimmy Page played guitar on Hurdy Gurdy Man. Really. That’s crazy! “Jennifer Juniper” is amazingly beautiful. “Get the Barrings” is worth the price alone. It sounds like something Olivia Tremor Control could’ve done. It wasn’t a hit, but was way ahead of its time. Speaking of Olivia Tremor Control and their Elephant 6 ilk, the Decemberists seem to have an affinity for Neutral Milk Hotel. Aspects of that scene still work, but some of it was superfluous. I don’t know what the shelf life is. The constant re-creation of Pet Sounds gets old and hackneyed and may’ve led to that scene’s ultimate demise. But Apples In Stereo and Neutral Milk Hotel were fantastic. It was the school of songwriting where it was melody over meaning. Lyrically, a little is lacking. Tell me about the 5-song Hush Records EP you did prior to Castaways? That’s pretty rough. You could see our auspices there. It was constricted by a 3-day recording budget. It’s bare bones, very little overdubbing, but it set the stage. The songs are good. We re-recorded some for Castaways, but they didn’t seem to fit. What’s with the gripping seafaring imagery of your albums? I’ve had a fascination for nautical fiction by Patrick O’Brien, C.S. Forrester. After moving to Portland, I noticed tons of unconscious ocean references. It had to do with my environment. How would you contrast Castaways And Cutouts against Her Majesty? The songwriting has a wider range of characters on Majesty. I didn’t want to paint myself into a corner as someone who exclusively writes about Dickensian characters. But Castaways gathers those in one place. I wanted Majesty to be more dynamic, making sure there aren’t just Victorian archetypes. These are characters with an arc. Their narratives have a beginning, middle, and end short story approach. Also, we had more time to experiment with sounds and instruments, whereas Castaways was recorded at breakneck pace for a paltry budget. We released it into the void with no idea what its fate would be. It was mostly me in the studio 12 hours a day with the engineer trying to get band members in while they took time off work. There was a certain desperation as a consequence. We cut corners. We tried to put strings on Castaways, but it was an unmitigated disaster. The temptation is to go back and finish it the way we wanted, but that’d be blasphemy. On Majesty’s 7-minute neo-Classical excursion “The Gymnast,” you inject strings. The strings didn’t go as smoothly as we’d hoped, but it was a step up. “The Gymnast’s” strings were sort of accidental. It was a cut and paste job of stuff we could use – not to dispel any illusions. The most accessible track may be the picturesque ode, “Los Angeles I’m Yours,” which praises the city before bringing forth doubt. That was my intent. I have a love-hate relationship towards L.A. I find it fascinating, especially considering my rural background. At first, I thought it was a mythic place. After a few visits, I found there was a saccharine sweetness that inspired nausea. Through the melody and arrangement I was trying to illustrate my feelings in an AM gold sound, juxtaposing that with dour lyrics makes a nice tension. “Song For Myla Goldberg” seemingly lionizes her Bee Season novel about adolescent insecurity and Jewish mysticism. The book has to do with a Jewish family raising a child involved in the spelling bee circuit and her coming to terms with her Jewishness. It’s a sweet coming of age novel. It wasn’t so much the novel that grabbed me but the things it was saying. I met Myla with another author-friend, Thisbe Nissen. They were in town doing readings and I was showing them around town. We ran around from club to club so the song’s a reflection of that. “The Soldiering Life” proclaims ‘on the battlefield our guns blaze away’ before triumphant trumpet soaks the coda. Does that song relate to Majesty’s apocalyptic cover? The cover’s intended to illustrate how we imagine a rosy picture of trench life. All around you’ve got war debris, shrapnel, torn apart trees, but soldiers act comradely. That’s what “The Soldering Life” depicts well – the relationship and devotion between two soldiers the night before they go over the top. The artwork’s by my girlfriend, Carson Ellis. She’s a full time illustrator for local weeklies and national magazines. I met her at University of Montana. She was in art school. I’d been searching for a way to put our love for art and music together. She did the painting on Castaways also.